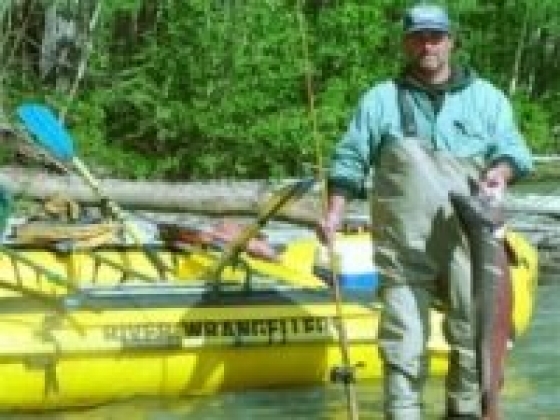 River Wrangellers offers fishing guide service on the Copper River, Gulkana River, Klutina River and Tonsina River. Catching King Salmon & Sockeye Salmon. We are affiliated with the oldest river guiding company in Alaska, NOVA River Runners, who directs our operations as an extension of theirs. All our Copper River fishing guides are given the same training by the same people who made NOVA's operations ground breaking industry standards. Our services range from scenic and whitewater day trips on rivers in the Copper Center area to world class Copper River fishing trips. Our home is on the boundary of the Wrangell-St. Elias National Park, the largest National Park in the Country! This entire region is noted for its unique geology, rich history, abundant wildlife (including some of the best king and red salmon fishing in Alaska, and spectacular natural beauty. These are all part of the experience you will enjoy on all trips offered by River Wrangellers. Alaska, Copper River area guided fishing for king salmon, sockeye salmon, silver salmon and rainbow trout on the Gulkana, Klutina and Tonsina Rivers of the Copper River Valley. The Gulkana is one of only 25 rivers in Alaska to become a "National Wild and Scenic River" with outstanding scenic, recreational, geologic, fish, wildlife, historic and cultural values. Our fishing excursions focus on the excellent king and red salmon fishing along the lower river. The slower water on this segment, before entering the Copper River, provides a greater area to fish and hone fly-fishing skills. There is a large population of Bald Eagles, and their nesting sites straddle the river where a salmon dinner is likely. There are plenty of other wildlife being drawn to the shore of this special environment. 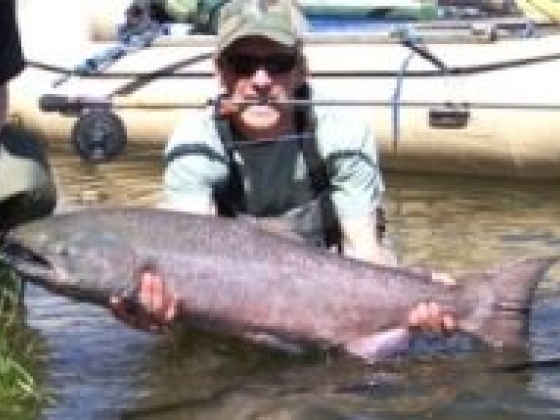 King Salmon Fishing - Starts early June and peaks late June till closure in mid July. 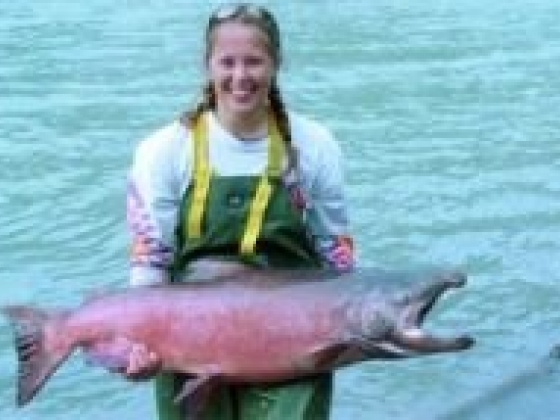 Sockeye Salmon Fishing - Starts mid June and peaks late June till mid August. Half day fishing trip - $225 per person, 4 per boat max Full day fishing trip - $325 per person, 4 per boat max Trips include all fishing gear. Lunch is provided with full day trips. The Klutina River claims some of the largest King Salmon in the Copper River region. There's intermittent class III whitewater, limited road access and tight eddies that help keep the angling pressure down on this river, one best king and red salmon fisheries in Copper River Country. The sockeye salmon fishing is challenging with big runs and a longer season. The Copper River Red is the all time favorite with Alaskans and fine restaurants in the Northwest for taste. King Salmon - July 01 - August 10 Sockeye Salmon - Late June - August 30 Half day fishing trip - $225 per person, 4 per boat max Full day fishing trip- $325 per person, 4 per boat max Trips include all fishing gear. Lunch is provided with full day trips. Tonsina river is very similar to the Klutina king and sockeye salmon populations and timing, but that is where similarity ends. This fast glacial fed drainage has a lot more class III and several class IV rapids that have kept the population of anglers willing to challenge the whitewater very low. Our whitewater expertise makes this trip a fun and adventurous mix of whitewater and great fishing with no one else around. The run is 23 miles so we only offer full day trips with fishing. Typically 8 to 10 hours with transport, lunch and refreshments. This is also the last river drainage in the upper Copper River Basin with a good Silver Salmon Run. We'll be exploring the Coho fishing opportunities here in late August and September. Full day fishing - $375 per person, 4 per boat max Trips include all fishing gear. Lunch is provided with full day trips. Trips operate daily. Call for reservations. Multi Day Fishing Trips Designated a National Wild and Scenic River, the Gulkana River offers many fishing and wildlife viewing opportunities, not to mention the peaceful serenity of the pristine wilderness. Offered as a four day, 50 mile trip with the option of 5 days for more time fishing. The fishing on the Gulkana River is world class with good king, June 2 - July and red salmon runs, mid June - August. This is one of the best grayling fisheries with big, 8 to 16 inch feisty and abundant fish hitting almost anything. This is home to the most northernly native population of rainbow trout in North America. They are catch and release with abundant hits following the salmon runs for their flesh and eggs from July on. All camping gear provided to make participation easy. 4 Day price - $2000 per person. You're not likely to encounter any other anglers on this trip. The challenging class III and IV whitewater during the first half of this river has kept the usage way down. Consequently, your fishing opportunities and overall backcountry experience improve dramatically as compared to other rivers in Alaska with limited road access. In addition, the chance of viewing wildlife dining on vegetation and salmon along the shore is greatly enhanced with the lack of jet boats scaring them away. The fishing is excellent for king and red salmon. The runs coincide with those of the Klutina River. There's also the bonus of silver salmon in late August and September. trout Rainbows are also a good bet following the king and red runs for eggs and flesh. Grayling and Dolly Varden fill in the hit list. This trip is like our Tonsina day trip but with no hurry to float and fish 23 miles of beautiful scenery. Instead, we'll savor the good hitting spots as we come across them and camp near a good one for the night. On day 2 we'll be rested and ready to do it again until we reach the Edgerton Road in the late afternoon. This is a great trip for the non-fisherman to accompany a fisherman on. All camping gear is included to make it easy to participate. Price $1000 per person.